Above: Long Hill Farm lies on the left, just before the sign to the Goyt Valley on the road from Buxton. 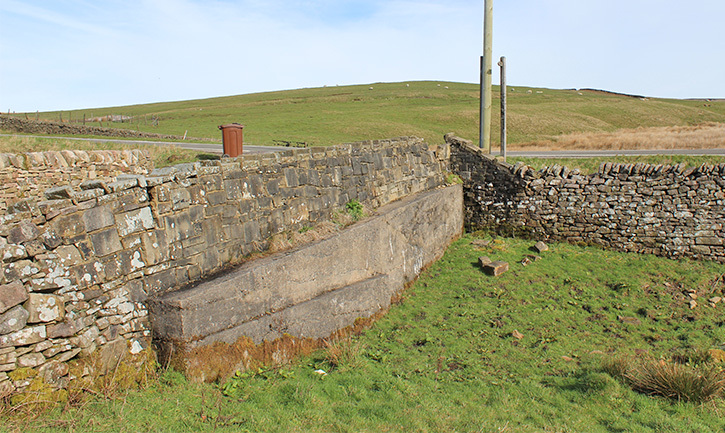 Above: Could this have been the very spot that Farmer Thomas Dunn lost his life (click to enlarge)? It’s certainly been strongly reinforced over the years. My thanks to Paul who got in touch after the previous couple of posts on the Hibbert family. Paul’s wife, Tanya, is related to George Hibbert (her 6x great grandfather) and has collected a few documents during her research into the family name. Among them was a newspaper cutting reporting the inquest into the death of Thomas Dunn outside George’s Long Hill Farm in 1884. An inquest was held on Saturday last at the farm house of George Hibbert, Long Hill, before R. Barrett, Esq., touching the death of Thomas Dunn, of the Nook Farm, Fernilee, which was caused by his being thrown out of a trap on Thursday night, the 15th inst. The jury having viewed the body, the following evidence was given. George Hibbert said: I live at Long Hill, near Buxton. On Thursday night the 15th inst. I was with the deceased Thomas Dunn, coming from Tideswell Fair, and when we arrived at my gate I asked Mr Dunn if I should go forward with him as it was very dark. He said “Heaven bless thee, George, I shall manage.” I then got out of the conveyance and bid him good night. Whilst I was opening the gate I heard a smash against a wall, but I could not see what it was. I returned to where I had left the deceased which was about ten or fifteen yards from the gate, and there found the horse and cart thrown over on the side of the wall, but I could not see the deceased. I called out to Mr. Dunn but could not get a reply. I then called for a light, and when that was procured I saw that the deceased was lying upon his back with the horse upon him, in fact, the whole of his body was covered by the body of the horse. I then assisted to get him out, and when I had done so, I found that his life was extinct. It would have been about three-quarters of an hour at least from the time I heard the smash to deceased being got out. I was sober at the time of the occurrence, but had had drink. The deceased was in a similar state, he having drank two or three glasses. At this place there is a deep drop or excavation under the wall, and no protection between the road so that a person not having drink at all by taking the wrong rein might have met with a similar accident. John Swindells of Long Hill said: OnThursday night, the 15th inst, at a little before twelve o’clock, I was called out of bed by George Hibbert’s daughter, who asked me to come to their gate as she thought Mr. Dunn was killed. I got up immediately and went to the place, and when I got there I found the last witness holding a horse by its head, the deceased was lying on his back in a hollow under the wall adjoining the turnpike road. The horse was away from the conveyance which was lying about five yards from it. I examined the place and perceived a man’s legs protruding from underneath the horse’s body. George Hibbert said “I think you can pull the deceased (Mr. Dunn) from under the horse.” I tried to do so but could not. When the body was extricated I saw that it was that of the deceased. As to the state of sobriety of the last witness I could not swear whether he was sober or not. One of the cart shafts was broken off, but still attached by the harness to the horse. The deceased was in such a deep hollow that the horse had turned over on to its back on the deceased and could not rise, his legs being in the air. The road I consider is a very dangerous one, extending one hundred yards from the farm gate belonging to George Hibbert. The night was very dark. It would be very say for anyone driving along this portion of the road to be overturned into one of the hollows, by pulling the wrong rein. Several other accidents have occurred on the same road. Dr. Flint of Buxton said: On Friday morning last at about quarter past one, I was called up to Long Hill by John Swindells, the last witness. He told me Mr. Dunn had met with an accident, and that he was afraid that he was killed. I went and found the deceased lying on a sofa in the house. I examined him and found that he was dead. I observed a severe wound on the right side of the face, and a fractured of the cheek bone. The veins of the neck were much swollen, and the soft parts of the neck much contused. I have have just examined his body, and found a great many bruises but no fractures of the limbs. The fracture of the bones off the face would be sufficient to cause insensibility, but the shock itself I think from the smash would be sufficient to cause death. The weight of the horse would contribute towards it, but the shock and the fracture were sufficient to cause death. The jury after hearing the evidence, gave a verdict of ‘Accidental Death’, but strongly recommended that the highway authorities should try to make up the dangerous hollows in the road.